The Conservative party leadership campaign has unleashed pro-Israel quackery, but it is the NDP race that could have greater impact on Canada’s Palestine policy. Aping Donald Trump, former Conservative minister Kellie Leitch recently asked her Twitter followers to “join me in calling on the Government of Canada to immediately move our embassy in Israel to Jerusalem.” This would likely contravene international law. A Facebook ad for former foreign minister and leadership frontrunner, Maxime Bernier, was titled “my foreign-policy is simple: put Canada first”. It linked to a petition saying, “foreign policy must focus on the security and prosperity of Canadians — not pleasing the dysfunctional United Nations … which for years has disproportionately focused its activities on condemning Israel.” Evidently, putting “Canada first” means advancing Israel’s diplomatic interests. While ‘I heart Israel’ and ‘I really heart Israel’ bile flows out of Republican Party North, it is the NDP contest that’s more likely to shape the Palestine debate going forward. Since party members rejected leader Thomas Mulcair, who once said “I am an ardent supporter of Israel in all situations and in all circumstances”, the Canadian Jewish News has run an editorial, front-page story and column expressing concern about how the NDP’s leftward shift will impact Israel policy. As the NDP race revs up expect Palestine to be debated in a way that troublesIsraeli nationalists. “Sid Ryan for NDP Leader”, a website launched to enlist the former head of the Ontario Federation of Labour to run for the head of the party, notes: “Sid Ryan’s advocacy for the Palestinian people, starting in his days in CUPE where he endorsed the Boycott, Divestment, Sanctions movement, shows that an NDP leader could muster broad support for a process where Canada is non-aligned, expresses solidarity with Palestinians and other oppressed nations in the Global South, and champions a foreign policy based on peace, democracy, social justice and human rights.” If Ryan enters the race. his support of Palestinian rights will set the bar fairly high on this important international issue. Another individual discussing a run, Jagmeet Singh, was the only member of the Ontario legislature to speak out against an Ontario legislature vote to condemn BDS in December. Singh criticized a Centre for Israel and Jewish Affairs backed motion supporting the spurious “Ottawa Protocol on Combating Anti-Semitism” and rejecting “the differential treatment of Israel, including the boycott, divestment and sanctions movement.” Cognizant of party members’ support for Palestinian rights, Singh likely had a federal leadership bid in mind when he addressed the Ontario legislature. The only individual officially in the race, Peter Julian, has said little on the subject. As a former critic and NDP House Leader, Julian needs to clearly distance himself from Mulcair’s shadow on the issue or it will dog his campaign. The Green Party’s recent stand in favour of Palestinian rights demonstrates that progressives want action on the issue. Despite opposition from the media and popular party leader Elizabeth May, Green members voted overwhelmingly to support “economic measures such as government sanctions, consumer boycotts, institutional divestment, economic sanctions and arms embargoes” to pressure Israel. Progressives are less and less likely to be confused or intimidated by pro-Israel groups and their media lackeys. At this point a backlash against an NDP candidate’s support for Palestinian rights would likely increase their chance of winning the leadership. (In a somewhat relevant parallel, Jeremy Corbyn seems to have benefited from pro-Israel media attacks during his bid to lead the British Labour Party). The considerable disconnect between the corporate media and engaged progressive opinion on Palestinian rights makes it important for the solidarity movement to politicize the subject when politicians are seeking the support of progressive party members. It is during the leadership fight that the Palestinian solidarity movement has the most leverage to force politicians to articulate a clear position. While past governments have made halting efforts to do as much, Ottawa doesn’t currently differentiate between “Israel proper” and the Occupied Territories. The two-decade old Canada–Israel free trade agreement allows settlement products to enter Canada duty-free. The European Union trade agreement, on the other hand, explicitly precludes Israel from putting “made in Israel” on goods produced in the occupied West Bank. Nor does Ottawa distinguish between Israel and the Occupied Territories in immigration policy. Individuals who live in illegal settlements are able to enter Canada without a visa like all Israelis. Additionally, a number of registered Canadian charities raise funds for projects supporting illegal Israeli settlements. Since all NDP candidates likely claim to support international law calling on Ottawa to implement a Security Council resolution shouldn’t be tough. While 2334 is a low bar, Canada’s tilt in favour of Israel is so pronounced that getting NDP candidates to commit to take action against illegal settlements would have significant ripples. Its long-term impacts would certainly outweigh the ‘I heart Israel’ ravings from the Conservative Party. Harper’s Conservatives have a thing for monarchy, the more absolute the better, it seems. At home they’ve put up portraits of Queen Elizabeth II and added the moniker “royal” to the Canadian Navy and Air Force while in the Middle East they’ve strengthened Canada’s ties to kingdoms from Morocco to Saudi Arabia. Jordan’s pro-US/pro-Israel King Abdullah II has been the focus of significant attention with the Conservatives signing a free trade and military cooperation agreement with that country last year. Now the Conservatives are strengthening Canada’s ties to a monarchy confronted by an influx of Syrian refugees, volatile regional geopolitics and popular protests. Even the aid the Conservatives are sending to Jordan for Syrian refugees is largely designed to bolster the country’s monarchy. Over the past year Jordan has become a central staging ground for Syrian rebel groups. Weapons from the Gulf monarchies and the US are flowing through Jordan and the CIA is training Syrian rebels there. According to France’s Le Figaro, Jordan has opened its airspace to armed Israeli drones monitoring Syria while the Financial Times reports that the US has 1,000 troops and a number of F-16 fighter jets in the country. While Jordanian officials say they will not let their country be used as a launchpad for any Western military intervention against Syria, they recently allowed the US (and others) to conduct war games near that country’s border. And three weeks ago Jordan hosted the military chiefs from the main opponents of Bashar al-Assad — the US, Saudi Arabia, Qatar, Turkey, France, Canada etc. — to discuss the conflict. Not surprisingly, the Syrian regime is unhappy with its southern neighbour. Syrian officials have said Jordan was “playing with fire” in allowing the US and others to train and arm its opponents, which includes many jihadists who could end up turning on Jordan’s regime. While King Abdullah II likely doesn’t trust the Syrian rebels and is fearful of retaliation from his larger neighbour, Jordan is under significant pressure from Ryadh and Washington to back Syria’s opposition. As it contributes to instability in Syria, Jordan is also a victim of the conflict. At least 600,000 Syrian refugees have crossed into the country of 6.3 million people. This has added to the pressure on a Jordanian monarchy that’s faced a series of pro-democracy protests over the past two years. Additionally, the US military’s growing presence in the country is not popular. Worried about the Jordanian monarchy’s ability to survive this volatile political climate, Canada has worked to bolster the regime. Under the guise of helping Syrian refugees, Ottawa (alongside Saudi Arabia, Qatar and the US) has made a series of major aid announcements over the past year. $6.5 million for Syrian refugees in Jordan in August 2012, then another $13 million in March and in June Ottawa announced a three-year $100-million aid package to Jordan. Buried in Ottawa’s announcements about the Syrian refugee crisis is the fact that much of the money on offer is for “security programming”. Foreign Affairs explains: “Canada is providing equipment and vehicles to the Jordanian Armed Forces (JAF) to assist in their efforts to transport Syrian refugees from the border to registration centres. Canada will also provide equipment and infrastructure support to the Public Security Directorate (PSD), the Gendarmerie Forces (GF) and the Civil Defence Directorate, which provide security and other essential services within new and expanding refugee camps. In addition to the trade accord, the Jordanian military has benefited from Canadian military support. Canada and Jordan signed a defence co-operation memorandum of understanding in the spring of 2012. At the end of last month the Chief of the Defence Staff, Gen. Tom Lawson, met his Jordanian counterpart and, according to the Jordan Times, “discussed ways to boost cooperation and coordination between the two countries’ armed forces.” This meeting followed on the heels of another meeting between the heads of the two countries militaries in April and Canada’s participation in a military exercise with 17 other “friendly” countries, Eager Lion 2013, hosted by Jordan’s armed forces. Foreign minister John Baird has visited Jordan three times since last August to discuss “the ongoing turmoil in Syria” among other issues. What Baird and Jordanian officials almost certainly don’t talk about is the country’s pro-democracy struggles, which have flared up over the past two and a half years. The Conservatives were silent when thousands of Jordanians marched against the monarchy and for better social conditions in March and April 2011. A handful of protesters were killed and hundreds arrested in a country that prosecutes individuals for “extending one’s tongue” (having a big mouth) against the King. A few months after the “Arab Spring” protests Foreign minister Baird claimed: “King Abdullah II in Jordan has really expedited reforms they were already working on.” But Baird’s positive portrayal of Jordan’s reforms doesn’t withstand scrutiny. Labour unions and independent media are heavily restricted while elections mean little. In short, Jordan remains an absolute monarchy with power concentrated in the hands of a ruling clique. Just the way Harper’s Conservatives like it. The Obama administration is looking to attack Syria. If they go forward without UN approval, the US would once again be violating international law and would likely inflame a conflict that’s already left 100,000 dead and displaced millions more. At the same time as they are calling for war the Conservatives are telling a skeptical public that Canada won’t be significantly involved in any military action. “We have no plans of our own to have a Canadian military mission,” Harper told the press. Yet, ten days ago the head of the Canadian military met generals from some of the main countries backing Syria’s rebels to discuss the prospects of building an international coalition force. Chief of the Defence Staff Gen. Tom Lawson traveled to Amman alongside the top generals from the US, Saudi Arabia, Qatar, Turkey, Jordan, the UK, Italy, France and Germany. The three-day meeting was co-hosted by the chairman of the US Joint Chiefs of Staff, Gen. Tartin Dempsey, and Jordan’s chief of staff Lt.-Gen. Mishaal Zaben. While initially trying to keep the trip secret, the Department of National Defence later shifted gears claiming, “These meetings were planned months in advance and were not in response to the escalating situation in Syria.” This is hard to believe as Lawson traveled to Jordan just four months ago. Notwithstanding their support for the rebels and involvement in military planning, Harper’s Conservatives had been relatively restrained with their public comments on the violence in Syria. Compared to their belligerence towards Iran, Hezbollah, and the Palestinians, they’ve taken a slightly more nuanced position towards Syria, which reflects the fact that the Israeli establishment is torn between its desire to weaken Hezbollah and Iran by overthrowing Assad and its fear that Islamists taking over in Syria could lead to more volatility in the occupied Golan Heights. 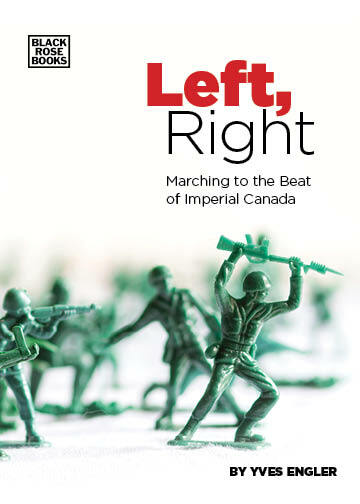 At different points both Prime Minister Harper and Foreign Minister Baird have recognized that the war is not simply a brutal dictatorship crushing innocents but that there is also a sectarian element to the conflict and the rebels include many unsavory characters. Despite recognizing the extremist nature of some Syrian rebels, the Conservatives have yet to add any Syrian group to Canada’s list of banned terrorist organizations. Unlike the US, UK, and UN, Canada has not designated Jabhat al-Nusra (Nusra Front) as a terrorist group. This might help explain why Canadians are thought to be over-represented among Western fighters in Syria. The Toronto Star reported that during the past year at least 100 Canadians have left to fight with the rebels in Syria. At the regional level Ottawa has denounced Iran, Hezbollah, and Russia for supporting the regime of Bashar al-Assad but they’ve ignored the role Saudi Arabia, Turkey, the UAE and Qatar have played in the conflict. According to front-page Financial Times and Wall Street Journal articles, Saudi Arabia and Qatar have plowed billions of dollars worth of weaponry and other forms of support to the rebels. But there hasn’t been a public peep from the Conservatives about the Saudi’s and Qatar’s role in exacerbating the violence in Syria. Instead of calling on these repressive monarchies to desist, they have deepened Canada’s ties to the rebels’ main diplomatic and arms benefactors. Over the past couple years Ottawa has ramped up arms sales to Saudi Arabia and the other Gulf monarchies backing the rebels. At the start of 2010 the government-backed Canadian Association of Defence and Security Industries (CADSI) sent its first-ever trade mission to Saudi Arabia while in 2011 the Conservatives approved arms export licenses worth a whopping $4 billion to Saudi Arabia. In February, 25 Canadian companies flogged their wares at IDEX 2013, the largest arms fair in the Middle East and North Africa. “We’re excited to see such a large number of Canadian exhibitors,” said Arif Lalani, Canada’s ambassador to the United Arab Emirates, where IDEX 2013 was held. “These companies represent the best Canadian capabilities and technologies in a number of areas of the defence and security sector.” As part of their effort to promote Canadian weaponry, Ottawa sent HMCS Toronto to the UAE during IDEX. If the Canadian government cared about Syrians, over the past two and a half years they would have been calling on Russia, Saudi Arabia, Iran, Qatar, Hezbollah, Washington etc. to stop the flow of arms into Syria, which only prolongs people’s suffering. At the same time they would have been pushing aggressively for a negotiated resolution to the conflict. The double standard of Israel-no-matter-what supporters can reach spectacular proportions. The recent case of Liberal Party leadership candidate Justin Trudeau’s speech proves the point and also illustrates the tactics employed to demonize the Islamic community. Montreal-based anti-Muslim website Point de Bascule and pro-Israel Jewish group B’nai Brith successfully turned Trudeau’s speech to the Reviving the Islamic Spirit conference last weekend into a controversy. With help from some right-wing media outlets they made a big deal of the fact that one of (17) sponsors of the Toronto event has been accused of aiding Hamas by the Canada Revenue Agency (CRA). In a bid to quiet the controversy the International Relief Fund for the Afflicted and Needy (IRFAN), which is challenging the CRA’s accusations in court, withdrew its sponsorship of the conference. Operating in a dozen countries, IRFAN is a leading Canadian Muslim charity that sponsored four thousand orphans at its high point. A big part of the CRA’s supporting evidence was that IRFAN worked with the Gaza Ministry of Health and Ministry of Telecommunications, which came under Hamas’ direction after they won the 2006 election. The Mississauga-based organization tried to send a dialysis machine to Gaza and continued to support orphans in the impoverished territory with the money channeled through the Post Office controlled by the Telecommunications Ministry. This author cannot claim any detailed knowledge of the charity, but on the surface of it the charge that IRFAN was a front for Hamas makes little sense. First of all, the group was registered with the Palestinian Authority in the West Bank when the Fatah-controlled PA was waging war against Hamas. Are we to believe that CRA officials in Ottawa had a better sense of who supported Hamas then the PA in Ramallah? Additionally, the United Nations Relief and Works Agency (UNRWA) viewed the Canadian charity as a legitimate partner. In 2009 IRFAN gave UNRWA $1.2 million to build a school for girls in Battir, a West Bank village. The CRA spent hundreds of thousands of dollars investigating IRFAN. It appears that the Revenue Agency wanted to help their Conservative bosses prove that Muslim Canadians financed “Hamas terror”. And the recent controversy over Trudeau’s participation in the Reviving the Islamic Spirit conference demonstrates how the CRA’s accusation can be used to demonize the million-strong Canadian Muslim community and specifically to deter them from associating with the Palestinian cause. The case against IRFAN also illustrates the flagrant double standard between how Ottawa treats charities working in Israel versus those helping the much poorer Palestinians (Gaza’s per capita income is $1,483 whereas Israel’s is $31,000). It’s illegal for Canadians to aid any group directly or indirectly associated with the elected Hamas government in Gaza yet it’s legal — and government will foot part of the bill — to finance charities linked to Israeli settlements that contravene international law. The Conservatives have reinforced Canada’s post 9-11 anti-terrorism laws that make it illegal to directly or indirectly assist a half dozen Palestinian political organizations all the while embracing tax write-offs for illegal Israeli settlements. Guelph activist Dan Maitland emailed former foreign minister Lawrence Cannon concerning Canada Park, a Jewish National Fund of Canada initiative built on land Israel occupied after the June 1967 War (three Palestinian villages were demolished to make way for the park). In August 2010 Maitland received a reply from Keith Ashfield, national revenue minister, who refused to discuss the particulars of the case but provided “general information about registered charities and the occupied territories.” Ashfield wrote “the fact that charitable activities take place in the occupied territories is not a barrier to acquiring or maintaining charitable status.” This means Canadian organizations can openly fundraise for settlements illegal under international law and get the government to pay up to a third of the cost through tax credits for donations. The exact amount is not known but it’s safe to assume that millions of Canadian dollars make their way to Israeli settlements annually. Every year Canadians send a few hundred million dollars in tax-deductible donations to Israeli universities, parks, immigration initiatives and, more controversially, “charities” that aid the Israeli army in one way or another. So here we have the blatant double standard for all to see: The current Canadian government uses “anti-terrorism” legislation to prevent a dialysis machine from being sent to Gaza but encourages, through tax write-offs, donations to illegal settlements that have terrorized and displaced thousands of Palestinians. Shame on all those who voted for this government.